Easy to manoeuvre in height restricted areas. 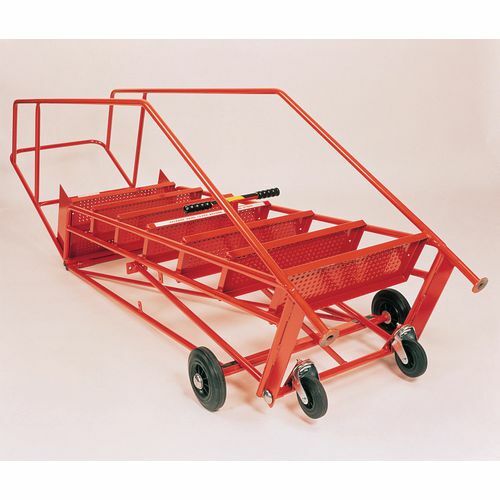 550mm width treads and platform - for safe use with both hands free. Handrail height above platform - 1000mm. Fitted with central 'Access Barred' retractable brake handle, which raises the front castors, allowing the feet to impact the floor. Rear wheels: 2 x 160mm dia. fixed wheels (5 & 6 tread), 2 x 200mm dia. (7 - 16 tread). Front wheels: 2 x 125mm dia. retractable swivel castors. Safety and convenience are two important features to look for when accessing high up areas. 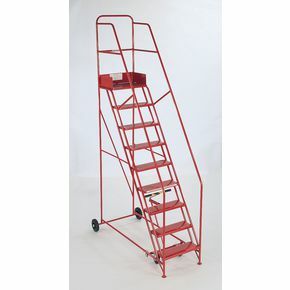 Our space-saving folding mobile steps are designed for ease of transportation and access in height restricted areas. They are fitted with an 'Access Barred' retractable brake; the front castors lift from the floor by using the centrally mounted retractor handle, this allows the feet to impact the floor, while providing access to the operator. 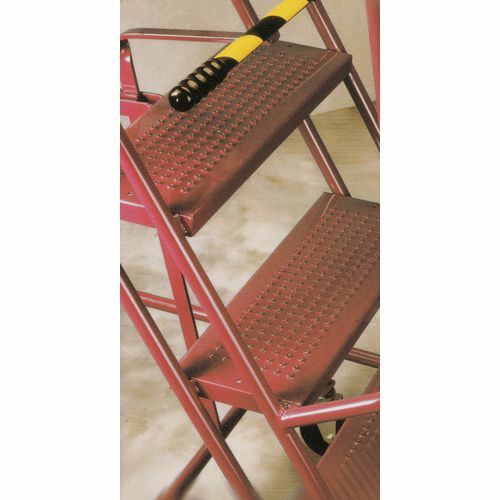 The multi-pattern, pierced and raised metal treads offer underfoot grip to the user making ascending and descending the steps safe. Wide 550mm treads and lots of platform space allow the user to work safety without having to hold on to anything leaving both hands free to perform tasks. They are supplied in a folded down package for easy delivery and finished in red paint. They are available in twelve platform heights; 1250mm, 1500mm, 1750mm, 2000mm, 2250mm, 2750mm, 3000mm, 3250mm, 3750mm or 4000mm. Our space-saving folding mobile steps are a safe and convenient way to work at height. They come with a 12 month guarantee and FREE UK Delivery.